Gingerbread! On the Xperia X10! Can you believe it?! 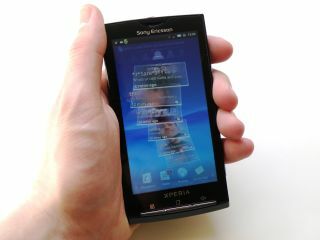 Sony Ericsson has announced that the Xperia X10 is to get an upgrade to Gingerbread this summer. We are agog at the news, given that Sony Ericsson previously told us that the Android 2.1 upgrade was the last that the X10 would see. Happily for X10 owners, Sony Ericsson says that work on the 2011 Xperia line-up, including the Play, Arc and Neo, made the new project possible. The update is by no means imminent, however, with Sony Ericsson looking to roll it out to unlocked handsets by the end of Q2/beginning of Q3 2011. Given that the handset launched in February 2010, we can imagine that many Xperia X10 owners will be just reaching the ends of their 18-month contracts at that point, and looking to upgrade to new hardware anyway. Handsets locked to a network may not be eligible for the software update, with the official blog noting: "Regarding possible customized operators kit we will have to get back with more information on this at a later stage. But we want to be very clear already at this stage on the fact that some of you may not get this upgrade." In the post, Sony Ericsson wrote: "The intention is that the Xperia X10 will receive similar software and functionality that we have in our new 2011 Xperia smartphones. "The current ambition is to provide the majority of functionality of the Gingerbread platform, as well as the Sony Ericsson specific UI and features that are not restricted by hardware limitations (for example no HDMI out). "The final scope of the software is still work in progress but we are working to minimize the differences."